Figure A53. Malpelo anomaly, interpreted as the Malpelo slab, with (horizontal) [vertical] cross sections through (A)[D] the UUP07 p-wave) and (B)[D] the combined SL2013 and S40RTS s-wave models at 1330 km; C) the location of the modern geological record that we interpret to have formed during the subduction of the slab. 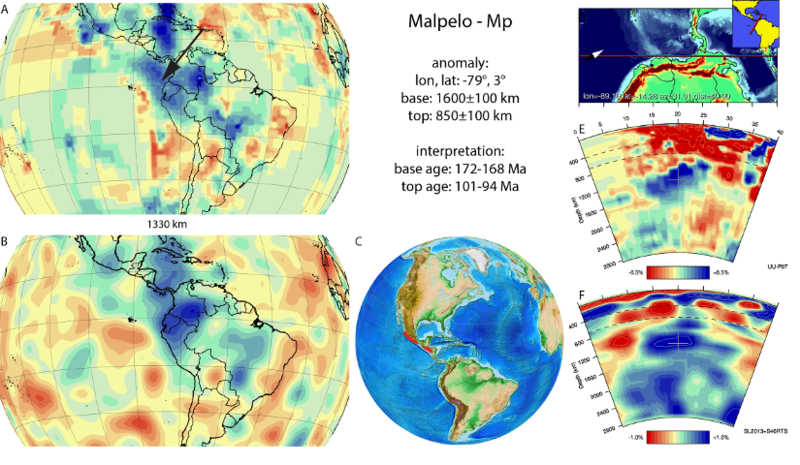 The Malpelo anomaly (Figure A53) is located below the western Panama Basin and NW South America in the mid-mantle. It is NW-SE trending and above 1175 km it is close to the Venezuela slab to the east as well as the Cocos slab to the north and Brasilia slab to the south. The anomaly we here define as the Malpelo slab was previously interpreted by Taboada et al. (2000) to represent subducted Farallon plate lithosphere (labelled FaP in their figures), beneath the Panama-Costa Rican Arc and the Choco terrane in northwest South America. Meschede and Frisch (1998) proposed that this subduction zone extended to the north, and connected to the subduction zone below the Guerrero terrane and Chortis block, which are now located in present day Honduras, Guatemala, and Mexico. Because the Malpelo slab appears to have a slight westward dip, van der Meer et al. (2010; 2012) followed models of Dickinson and Lawton (2001) proposed for the Guerrero arc and interpreted the slab as the result of westward subducting Mezcalera ocean lithosphere, followed by a collision with the North American margin in the Late Cretaceous, followed by a subduction polarity switch resulting in eastward subducting Farallon lithosphere at around 1040 km depth. The Malpelo slab, however, extends to the south into a position directly west of, and at a similar depth as the Venezuela slab. This slab is interpreted to result from westward subduction of Proto-Caribbean lithosphere below the Caribbean plate (van der Meer et al., 2010; Pindell et al., 2012; van Benthem et al., 2013). Placing the kinematic reconstruction of Boschman et al. (2014) in the slab-fitted mantle reference frame of van der Meer et al. (2010) places the eastern margin of the Caribbean plate above the Venezuela slab, but the western Caribbean margin above the Malpelo slab: there is little space for a westward subducting ocean to the East of the Malpelo slab. We therefore consider it more likely that the Malpelo slab originated from eastward subduction west of the Caribbean plate. The oldest reported evidence of subduction in Central America is arc volcanics of only ~75 Ma (Buchs et al., 2010; Wegner et al., 2011), and Pindell et al. (2012) suggested that the modern subduction zone below the eastern Caribbean region may have started ~90-85 Ma. This subduction zone, however, is still active whilst the Malpelo slab is detached. We consider it more likely that the current phase of subduction generated the slab above and slightly east of the Malpelo slab. This slab is visible in a narrow depth interval around 1000-900 km, above which a prominent slab gap is present that coincides with the location of and may be caused by the subduction of the Cocos-Nazca ridge. Given its narrow range, we have not defined this body as a separate slab. The Guerrero arc of Mexico may be a better candidate to date the Malpelo slab. This arc formed at a paleolatitude coinciding with the northern portion of the Malpelo slab. The history of the Guerrero arc is complex, but is seen as an intra-oceanic arc that was separated from Mexico by a back-arc region that closed in Early Cretaceous time (Centeno-Garcia et al., 2011). Bajocian–Cenomanian arc assemblages of the Guerrero terrane (Talavera-Mendoza et al., 2007; Martini et al., 2011; 2013) and Callovian to Valanginian volcanic sulphides (Mortensen et al., 2008) suggest that the arc was active from ~170-165 to ~95-90 Ma. We adopt this as age range for the formation of the slab. We note, however, that our interpretation suggests that the Guerrero arc would have continued far to the south, to the west of the Caribbean plate. Currently, there is no geological evidence to support this interpretation and the interpretation of the geological record of the Malpelo slab may need revision in the future.